Netbooks are both a blessing and a curse. Their modest dimensions make them ideal travelling companions, but in their efforts to keep them small, manufacturers are sometimes hamstrung when it comes to picking faster components. If your netbook feels ponderous, there are plenty of steps you can take to pep it up. 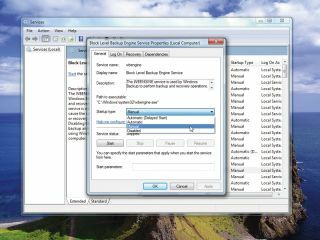 You can make a Windows netbook more responsive by removing unnecessary background processes and start programs. Identify extraneous startup programs using MSConfig. Click 'Start' and type msconfig in the search bar, then press [Enter]. Click the 'Selective Startup' radio button and switch to the 'Startup' tab. If there are any programs here that you can do without, uncheck them, click 'Apply' and restart your computer to find out whether your system boots OK without them. If it does, then return to MSConfig and use the information there to find out where the startup entry exists. Try to remove the startup option in the parent program, otherwise delete the registry entry or start-up shortcut. Similarly, Windows services run in the background all the time, too. Some aren't necessary when you're running a netbook, so you can get a bit of a boost by disabling them. Click 'Start', enter services.msc in the search bar and press [Enter]. Double-click the service that you want to stop and then choose 'Disable' next to 'Startup type'. Some services that you can comfortably disable include: Block Level Backup Engine Service, Bonjour Service (from iTunes), Certificate Propagation, Group Policy Client, HomeGroup Listener, HomeGroup Provider, Offline Files, Portable Device Enumerator Service, Software Protection (assuming you've activated Windows), SSDP Discovery, Windows Media Player Network Sharing Service and Windows Search (although you'll lose the ability to search for files instantly). If you use third-party security software, you can also disable Security Center and Windows Defender too. You can also improve speed by disabling visual effects. Choose 'Start', right-click 'Computer' and select 'Properties'. Next, select 'Advanced System Settings | Performance | Settings'. On the 'Visual Effects' tab, either select 'Adjust for best performance' or clear each visual effect that you can do without. Click 'OK' twice. If speed isn't an issue, resolution may be. Some netbooks are capable of more than the 1024 x 600 display offered. You may be able to get 1024 x 768 and 1152 x 864 in Windows 7 with a simple registry hack, after you've backed it up. Choose 'Start,' type regedit and press [Enter]. Choose 'Edit | Find' and enter Display1_DownScalingSupported. Uncheck 'Keys and data'. Click 'Find Next'. Modify each value of '0' to '1' and press [F3] to run Find Next again. Once you've modified all matching values to '1', restart your netbook. The new resolutions should be available when you right-click the desktop and choose 'Screen Resolution'.